As the 30th Anniversary of the TD Ottawa International Jazz Festival wraps up, there's been more than the festival's normal good share of great performances. The weather cooperated overall, with only a few minor glitcheseven the normally brutal heat this time of year only made an appearance for a couple of days. As ever, the festival's group of volunteers did a terrific job at keeping things running smoothly, and its core staff, in particular Director of Marketing, Sponsorship and Media, Suzan Zilahi and Media Consultant James Hale made sure that transparency for the press was provided without sacrificing the artists' privacy, or the bond between those performers and their audience. As Jacques Emond retires this year, after programming the festival for its entire history, Executive Producer Catherine O'Grady, who has taken an increasingly active role in program, year-after-year, has ensured, by placing a greater emphasis on left-of-center and more Euro-centric programming, a festival that more accurately reflects the increasingly global nature of jazz. Her personal baby, the Improv Invitational series, experienced the best overall attendance in its five-year history, with some of its best programming to boot. If anything, O'Grady's series is at something of a crossroads in 2010. With some people having to be turned away for some of the performances on half of its eight evenings, it is starting to look as though the series has become too successful for its location. The National Arts Center Fourth Stagea club-like venue that seats approximately 150-175 peoplehas always been a wonderfully intimate venue for this adventurous series, but with performers like pianists Tord Gustavsen and Neil Cowley, trumpeter Tomasz Stanko and Katzenjammer attracting more people than the room can hold, and more than a handful of others coming darn close, it may be time for the festival to consider a large venue for 2011, like the NAC's larger Studio. 2010 also saw the introduction of the new Friends series, and while attendance did varyguitarist Bill Frisell's two nights were jam-packed, while drummer Matt Wilson's were woefully under-attendedclearly the festival is on the right track. Gone are the days when it was possible to attend each and every show, but if the worst thing that can be said about the festival is that it has too much from which to choose, that's a small quibble. With entry fees still amongst the cheapest to be found anywherethe $250 Gold Pass provides access to nearly 70 ticketed showsOIJF is not only a terrific bargain for locals, it's a festival that deserves to draw jazz fans from greater distances. It'll need to address a few logistical issues if it truly wants to appeal to an audience that lives up to its name as much as its roster does, but there's little doubt that the TD Ottawa International Jazz Festival continues on an upward trajectory. "Was it jazz," bassist Robert Davidson asked in a brief chat after The Wide Alley finished its mesmerizing performance at the Improv Invitational series. The bestand onlyanswer has to be another question, "Does it matter," and it's unlikely that anyone who was at the performance was spending any time worrying about what to call the music. A project that has taken a decade to come to fruition, thanks to the efforts of Australians Erik Griswold (piano) and Vanessa Tomlinson (percussion), and Chinese percussionist/vocalist Zou Ziangping, The Wide Alley is exactly the kind of programming that makes the Improv Invitational series so essential to the OIJF. With plenty of performances by better-known artists, it's shows like these that turn into sleeper hits, ones that audiences continue to talk about, long after the festival is over. A 10-piece ensemble equally divided between Australian instrumentalistsin addition to Griswold, Tomlinson and Davidson, also including trumpeter Peter Knight and trombonist Adrian Sherriff, who delivered a stunning a capella bass trombone solo during the set's opening number that, if any were needed, established all the jazz cred this group requiredand Chinese musicians from the Sichuan province, The Wide Alley married Orient and Occident, but went further still, creating a rich tapestry of sound that was equal parts education and entertainment. Singer Tian Linping demonstrated just how utterly different the traditions were, her voice on "Picking Begonias," transcending cultural differences to include off rasping sounds, an odd (to westerners) high-pitched voice and a delivery that, for those linguistically challenged, told the story in gesture rather than words. 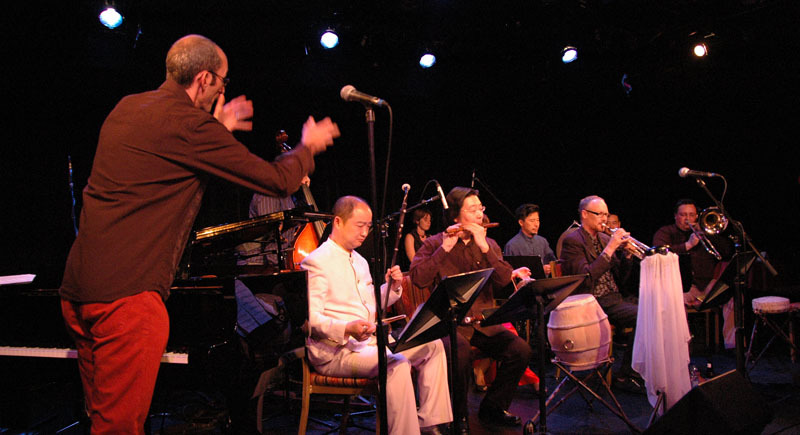 "Bicycle Groove," on the other hand, with The Wide Alley's Chinese contingent emulating the sound of a busy Sichuan street, was an instrumental feature for Knight, driven by Tomlinson's percussion and the gentle sounds of Shi Lei's bamboo flutes and Zhou Yu's erhu, or Chinese violin. Throughout the set, Griswold introduced the songs, and conducted much of the music, though the set's centerpiecethe 16-minute "Sichuan Opera Overture," was conducted, from across the stage, by percussionist Zhong Kaizhi, whose rigorous instructions to the tentet were essential to navigating this challenging piece of writingand because, according to Griswold, in Chinese Opera, it's the percussionist who is always the musical director. Tuned gongs and ethnic hand percussion blended with erhu, flutes, piano, brass and bass for a sound that was both reverential and forward thinking, true world music without the baggage of commercial labeling. The Wide Alley's performance was received, at first, with some curiosity, but by the end of its hour-long set Griswold, Tomlinson and Ziangping, along with the rest of the members of the group, had thoroughly captivated an audience that may have largely been on-hand for the Neil Cowley Trio show to follow, but which was clearly happy to have arrived early to catch what will go down as one of the 2010 OIJF's most unique and thoroughly compelling performances.